Our project team was treated to lunch today at the World War 2-themed 100th Bomb Group, which overlooks one of the runways of the Cleveland airport. I was glad to have planned ahead and brought my camera with me, as a pair of vintage WW2 fighters are on display outside the restaurant. 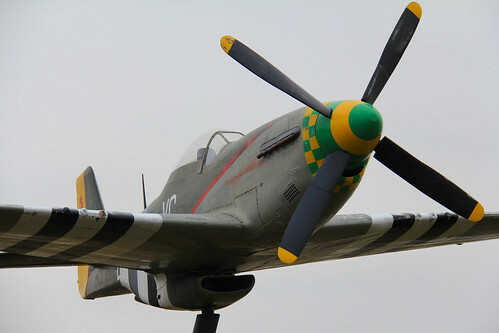 This is the P51 Mustang; the other is a P47 Thunderbolt. I had just been directly across the street from an active airport runway. I was fairly certain that the next chapter of my day would be a free trip to Gitmo with a bag over my head, but the officer completely surprised me by flashing his Nikon D90, and thus it was that we struck up a chat about our shared hobby. We talked about the quality of the light (he preferring bluer skies, I appreciating the evenness that an overcast sky provides at midday) and I explained the whole 365 project idea to him, which he seemed to find genuinely interesting. We each went on our way and I drove back to work, a bit perplexed, but not unhappily so.